Big changes are afoot in my signature Moon Goddess fertility yoga & meditation program, changes that I’m excited about and that will enable me to serve more women in a much bigger way. These changes mean a long-overdue price increase, but never fear: I’m offering you the opportunity to purchase before the price goes up (and while a 1-on-1 Fertility Strategy Session is still included with your purchase). ==>> If you know you want in now, go here. If you have some questions, I can help you with those too. Q: There are so many fertility programs out there. How do I know that this is the one I can put my faith in to get me the healing–and the baby–I want? A: The choice is overwhelming, it’s true. A lot of women come to Moon Goddess having already tried many different treatments and protocols and researched many others, dispirited about the chances of Moon Goddess being any different. So…what DOES make it different? 1) Nowhere else is there a fertility program that works directly with your menstrual cycle in each of its phases, so that you stop experiencing your period as a source of disappointment and take the pressure off ovulation by embracing your entire cycle. We work to heal both your hormonal imbalances and your lifelong relationship with your period–and that’s both unique and transformative. 2) Mind-body treatment of infertility patients has been shown to improve chances of conceiving by up to 55%, and this is the kind of result I see with Moon Goddess. But why Moon Goddess and not another mind-body program? Because not only does Moon Goddess provide the deep relaxation and stress reduction of mind-body treatment, but the Kundalini yoga and meditation I teach in the program works directly with the hormonal and reproductive systems to optimize their function and increase the probability of conception. 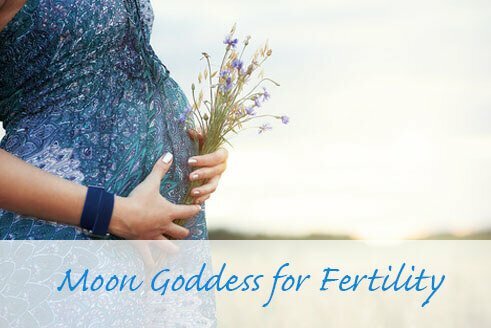 Moon Goddess harnesses the tools of ancient Kundalini practice, combines them with other proven fertility-enhancing techniques, and drills deep into your relationship with your female body and your cycle to create a program that is like none other I’ve seen. Q: A 55% increase in pregnancy is huge. Why does this work, and do you have any stats to back it up? Yes! One of my favorites comes from Harvard, where women who practiced mind-body techniques were 55% more likely to conceive after just 10 weeks. Why? Because anxiety impacts egg production and quality, reduction in stress and depression can improve conception rates, and the emotion-focused coping strategy of “letting go” has been shown to increase pregnancy success. Mind-body treatment like the Moon Goddess yoga and meditation program works on all these levels, reducing stress, anxiety, and depression through balancing your hormones, stilling your mind, erasing negative thinking, and restoring faith in your body’s ability to conceive. Plus the yoga I teach in Moon Goddess works directly on your pituitary gland, which is responsible for the hormones that get and keep you pregnant. Q: How can a video-based program done from my computer help me relax and reduce stress? I really think I’m more of an in-person kind of gal. A: Once you’re in the program, on your yoga mat, hearing my voice guide you through the poses and breath meditations, you’ll find that the energy and the benefits are very much like being in-person in a studio with me. Except you didn’t have to so much as open your front door to get there. The at-home, on-your-own-time aspect of Moon Goddess is what many women end up loving best: you can listen to an audio meditation in your darkened bedroom right before bed, you can fit your 3 favorite fertility yoga poses into the 15 minutes before you get ready for work, you can set your intention in the privacy of your own space. Moon Goddess works with your life as it is, while also providing a nourishing, relaxing break in the midst of your life. Q: I’ve had multiple miscarriages and have already spent thousands of dollars on fertility treatments. How can Moon Goddess help me? And there are so many others–women in their 30’s and 40’s who have healed their fertility and conceived with my expertly designed program Moon Goddess. There’s simply nothing like it out there to connect you with the Mother Energy of Creation, known in the yoga tradition as Mata Shakti. ==>> Join Moon Goddess before the price goes up Dec 24!